Todd Denault (author of Jacques Plante and The Greatest Game) emailed me late Sunday night to let me know of a late entry into the hockey book market. A late entry, and a potentially spectacular one at that. Denault, who spends a lot of time in bookstores (usually signing his own titles), discovered the interesting title Raising Stanley by Ross Bernstein. He was so excited about the book, he emailed me about it right away. "I'm in the hockey book section when I came across a book that I hadn't recalled seeing. The name of the book is Raising Stanley and the author is Ross Bernstein. I must admit that seeing a new book this late in the game really surprised me." It is amazing. Supposedly the release date was supposed to be back in September. Perhaps there have been distribution problems in Canada, because Ross Bernstein is a big name hockey writer. How big? He's got Scotty Bowman writing this book's introduction as well as Phil Esposito, Brett Hull and Joe Sakic writing forewords. 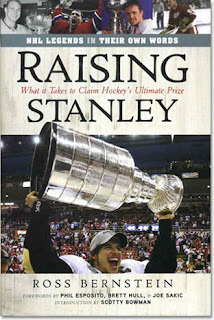 Raising Stanley is a book, as the subtitle states, about "what it takes to win hockey's ultimate prize." Bernstein looks at true meaning of winning the Stanley Cup through defining moments, great teams, great coaches and great celebrations. But the absolute best part - the part that makes this book so potentially awesome - is Bernstein has somewhere around 100 hockey legends interviewed and, in their own voices, they discuss their Stanley Cup memories. Not so much the game details, but more about the moment they actually won. Some talk about the moment they hoisted the Cup for the first time. Others talk about the celebrations later on. Some discuss the pain and anguish they went through, and how it was all worth it just to get a chance to kiss the Stanley Cup. Some of the players interviewed include Gordie Howe, Bobby Hull, Patrick Roy, Steve Yzerman, Rob Blake, Ken Dryden, Peter Forsberg, Igor Larionov, Jacques Lemaire, Frank Mahovlich, and Brendan Shanahan. Mr. Denault added in his email "it is amazing that something like this has flown so under the radar" and that it "is well worth the money and time." When a prolific hockey author like Todd Denault speaks so highly of another hockey book, I think well owe it to ourselves to check out Ross Bernstein's Raising Stanley for ourselves!